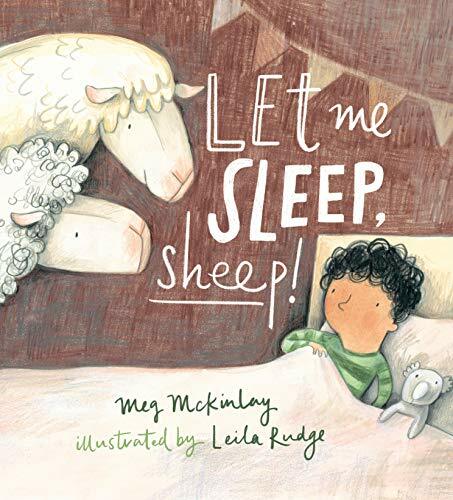 a book review by Monika Schröder: Let Me Sleep, Sheep! Amos is counting sheep to fall asleep, when suddenly those very sheep he’s counting in his head are dropping into his room, one after another. And they are not amused. Amos, still hoping to get to sleep, would like them to leave, but the sheep are not having any of it and instead they come up with a list of demands. First they want a fence. “If you want to count us, you need a fence. It’s the rules.” The sheep declare. Soon Amos is building a fence, piling objects from his room, while the sheep give him detailed instructions. And they are picky. The fence cannot be too high, not too low, not too wobbly. Finally, after the sheep made him test the fence by jumping over it, Amos falls asleep, while the sheep are looking on, satisfied with themselves. Leila Rudge’s soft-colored pencil illustrations give each sheep a distinct personality, adding to the humor of the story. This funny picture book by an Australian author/illustrator team turns the “counting sheep” story on its head. Children will love reading and/or listening to Amos’ unusual and whimsical bedtime adventure. Monika Schröder's most recent book is Be Like a Bird (Capstone Young Reader). winner of a 2016 Foreword Indie Award Honorable Mention for Juvenile Fiction.